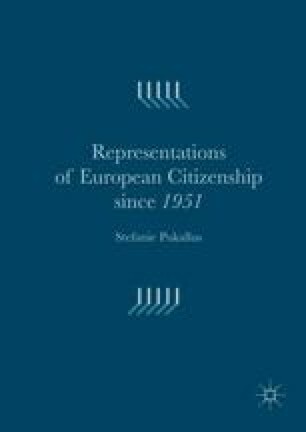 The first representation of European citizenship emerged in the context of the creation of the European Coal and Steel Community. Homo Oeconomicus, as a form of economic-social European citizenship, portrays a male qualified coal and steel worker (from 1957 a worker per se) of French, German, Dutch, Luxembourgian, Italian or Belgium nationality. The European Commission imagined that such a worker would happily use his newly acquired right to free movement in order to find work in another member state and ascribed social rights and benefits to the worker and his family. With the renewed impetus for greater European political integration in the late 1960s this representation began to become obsolete and was soon replaced by the representation ‘A People’s Europe’. Bossuat, G. (1998). Entretien avec Jacques-René Rabier, juin, http://www.eui.eu/HAEU/OralHistory/pdf/INT609.pdf. Accessed 15 Jul 2013. CCE (Commission des Communautés Européennes). (2012). EUROPA—Employment and social policy. http://europa.eu/legislation_summaries/employment_and_social_policy/index_en.htm. Accessed 15 Mar 2012. Conrad, Y., & Rancon, M. (2003). Entretien avec Paul Collowald. Histoire interne de la Commission européenne 1958–1973. http://www.eui.eu/HAEU/OralHistory/pdf/INT707.pdf. Accessed 12 Mar 2012. Dumoulin, M., & Cailleau, J. (2004) Entretien avec Fausta Deshormes née la Vallé. Histoire interne de la Commission européenne 1958–1973. http://www.eui.eu/HAEU/OralHistory/pdf/INT726.pdf. Accessed 12 Mar 2012. Dumoulin, M., & Legendre, A. (2003). Entretien avec Guy Vanhaeverbeke. Histoire interne de la Commission européenne 1958–1973. http://www.eui.eu/HAEU/OralHistory/pdf/INT698.pdf. Accessed 12 Mar 2012. European Economic and Social Committee. (2010). About the Committee. http://www.eesc.europa.eu/?i=portal.en.about-the-committee. Accessed 19 Dec 2011. European Council. (1977). Council directive 77/486/EEC of 25 July 1977 on the education of the children of migrant workers. http://eur-lex.europa.eu/LexUriServ/LexUriServ.do?uri=CELEX:31977L0486:EN:HTML. Accessed 26 May 2011. Meynaud, J., & Sidjanski, D. (Eds.) (1965). Science politique et intégration européenne. Genève: Institut d’Études Européennes. http://www.dusan-sidjanski.eu/pdf/Direction_Ouvrages/65_SciencePo_IntegrationEurop_VERS2.pdf. Accessed 29 Feb 2012. Meynaud, J., & Sidjanski, D. (1971). Les groupes de pressions dans la communauté européenne. Editions de l’institut de sociologie. Brussels: ULB. http://www.dusan-sidjanski.eu/pdf/Ouvrages/71_GroupesPressionCommEuro.pdf. Accessed 29 Feb 2012. Sélys, G. de (1996). ‘La machine de propagande de la Commission’ dans Le Monde diplomatique juin 1996. http://www.monde-diplomatique.fr/1996/06/DE_SELYS/3753. Accessed 22 Feb 2010. Sidjanski, D. (1996). Eurosphère—Dirigeants et groups européens. In F. D’Arcy, & L. Rouban (Eds. ), De la Ve République à l’Europe. Hommage a Jean-Louis Quermonne (pp. 279–298). Presse de la fondation nationale des sciences politiques. http://www.dusan-sidjanski.eu/pdf/Contributions/96_Eurosphere.pdf. Accessed 29 Apr 2012.